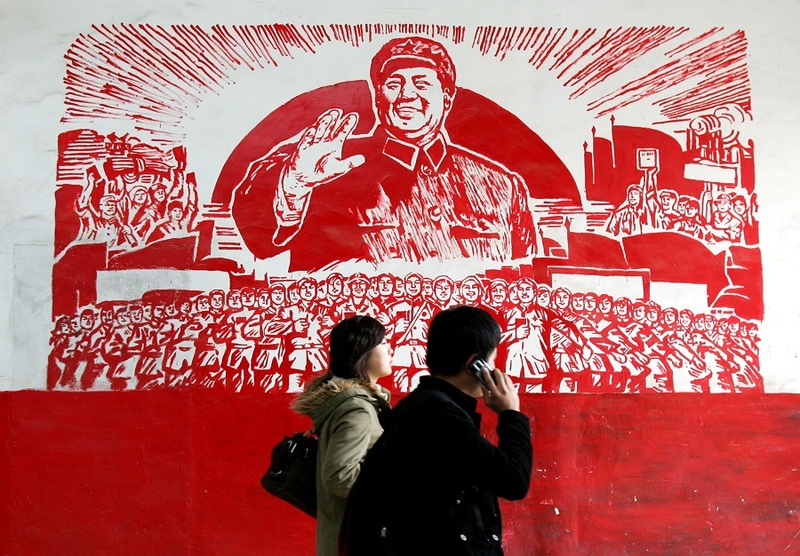 Visitors walk past a wall printed with the image of former Chinese leader Mao Zedong at the ‘Fun and Art’ festival in Xi’an, Shaanxi province, December 13, 2008. This piece was first published on the NYR Daily on February 5, 2018. In these pages nearly seven years ago, Timothy Snyder asked the provocative question: Who killed more, Hitler or Stalin? As useful as that exercise in moral rigor was, some think the question itself might have been slightly off. Instead, it should have included a third tyrant of the 20th century, Chairman Mao. And not just that, but that Mao should have been the hands-down winner, with his ledger easily trumping the European dictators’. While these questions can devolve into morbid pedantry, they raise moral questions that deserve a fresh look, especially as these months mark the 60th anniversary of the launch of Mao’s most infamous experiment in social engineering, the Great Leap Forward. It was this campaign that caused the deaths of tens of millions and catapulted Mao Zedong into the big league of 20th-century murders. But Mao’s mistakes are more than a chance to reflect on the past. They are also now part of a central debate in Xi Jinping’s China, where the Communist Party is renewing a long-standing battle to protect its legitimacy by limiting discussions of Mao. The immediate catalyst for the Great Leap Forward took place in late 1957 when Mao visited Moscow for the grand celebration of the 40th anniversary of the October Revolution (another interesting contrast to recent months, with discussion of its centenary stifled in Moscow and largely ignored in Beijing). The Soviet leader, Nikita Khrushchev, had already annoyed Mao by criticizing Stalin, whom Mao regarded as one of the great figures of Communist history. If even Stalin could be purged, Mao could be challenged, too. In addition, the Soviet Union had just launched the world’s first satellite, Sputnik, which Mao felt overshadowed his accomplishments. He returned to Beijing eager to assert China’s position as the world’s leading Communist nation. This, along with his general impatience, spurred a series of increasingly reckless decisions that led to the worst famine in history. The first signs of Mao’s designs came on January 1, 1958, when the Communist Party’s mouthpiece, People’s Daily, published an article calling for “going all out” and “aiming higher”—code phrases for putting aside patient economic development in favor of radical policies aimed at rapid growth. Mao drove home his plans in a series of meetings over the next months, including a crucial one—from January 11 to 20 in the southern Chinese city of Nanning—that changed the Communist Party’s political culture. Until that moment, Mao had been first among equals, but moderates had often been able to rein him in. Then, in several extraordinary outbursts, he accused any leader who opposed “rash advance” of being counter-revolutionary. As became the pattern of his reign, no one successfully stood up to him. Having silenced Party opposition, Mao pushed for the creation of communes—effectively nationalizing farmers’ property. People were to eat in canteens and share agricultural equipment, livestock, and production, with food allocated by the state. Local Party leaders were ordered to obey fanciful ideas for increasing crop yields, such as planting crops closer together. The idea was to create China’s own Sputnik—harvests astronomically greater than any in human history. This might have resulted in no more harm than local officials’ falsifying statistics to meet quotas, except that the state relied on these numbers to calculate taxes on farmers. To meet their taxes, farmers were forced to send any grain they had to the state as if they were producing these insanely high yields. Ominously, officials also confiscated seed grain to meet their targets. So, while storehouses bulged with grain, farmers had nothing to eat and nothing to plant the next spring. Compounding this crisis were equally deluded plans to bolster steel production through the creation of “backyard furnaces”—small coal- or wood-fired kilns that were somehow supposed to create steel out of iron ore. Unable to produce real steel, local Party officials ordered farmers to melt down their agricultural implements to satisfy Mao’s national targets. The result was that farmers had no grain, no seeds, and no tools. Famine set in. When, in 1959, Mao was challenged about these events at a Party conference, he purged his enemies. Enveloped by an atmosphere of terror, officials returned to China’s provinces to double down on Mao’s policies. Tens of millions died. No independent historian doubts that tens of millions died during the Great Leap Forward, but the exact numbers, and how one reconciles them, have remained matters of debate. The overall trend, though, has been to raise the figure, despite pushback from Communist Party revisionists and a few Western sympathizers. 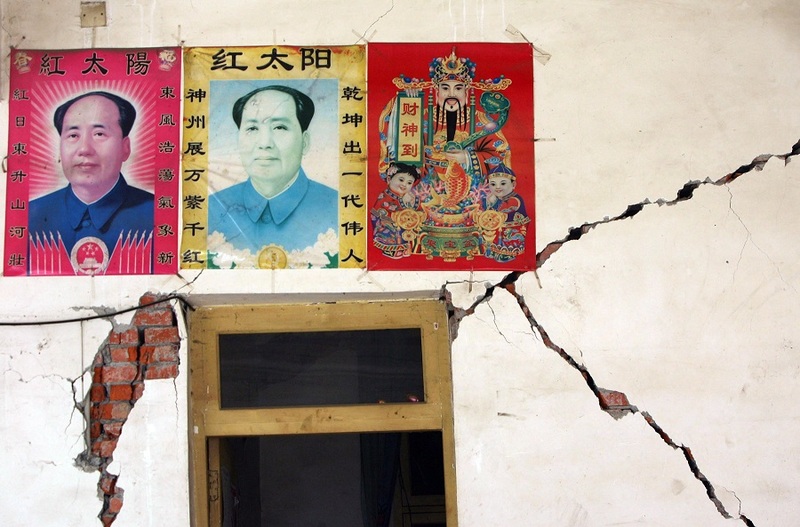 A wall showing the damage caused by an earthquake that occurred on May 12, 2008 in Sichuan province is decorated with portraits of former Chinese leader Mao Zedong, in Beichuan County, Sichuan province, May 31, 2008. More than 68,000 people died in the quake and around 4.8 million people were left homeless. On the Chinese side, this involves a cottage industry of Mao apologists willing to do whatever it takes to keep the Mao name sacred: historians working at Chinese institutions who argue that the numbers have been inflated by bad statistical work. Their most prominent spokesperson is Sun Jingxian, a mathematician at Shandong University and Jiangsu Normal University. He attributes changes in China’s population during this period as due to faulty statistics, changes in how households were registered, and a series of other obfuscatory factors. His conclusion: famine killed only 3.66 million people. This contradicts almost every other serious effort at accounting for the effects of Mao’s changes. The first reliable scholarly estimates derived from the pioneering work of the demographer Judith Banister, who in 1987 used Chinese demographic statistics to come up with the remarkably durable estimate of 30 million, and the journalist Jasper Becker, who in his 1996 work Hungry Ghosts gave these numbers a human dimension and offered a clear, historical analysis of the events. At the most basic level, the early works took the net decline in China’s population during this period and added to that the decline in the birth rate—a classic effect of famine. Later scholars refined this methodology by looking at local histories compiled by government offices that gave very detailed accounts of famine conditions. Triangulating these two sources of information results in estimates that start in the mid-20 millions and go up to 45 million. Two more recent accounts give what are widely regarded as the most credible numbers. One, in 2008, is by the Chinese journalist Yang Jisheng, who estimates that 35 million died. Hong Kong University’s Frank Dikötter has a higher but equally plausible estimate of 45 million. Besides adjusting the numbers upward, Dikötter and others have made another important point: many deaths were violent. Communist Party officials beat to death anyone suspected of hoarding grain, or people who tried to escape the death farms by traveling to cities. Regardless of how one views these revisions, the Great Leap Famine was by far the largest famine in history. It was also man-made—and not because of war or disease, but by government policies that were flawed and recognized as such at the time by reasonable people in the Chinese government. We can discard natural causes; yes, there were some problems with drought and flooding, but China is a huge country regularly beset by droughts and floods. Chinese governments through the centuries have been adept at famine relief; a normal government, especially a modern bureaucratic state with a vast army and unified political party at its disposal, should have been able to handle the floods and droughts that farmers encountered at the end of the 1950s. What of the explanation that Mao meant well but that his policies were misguided, or carried out too zealously by subordinates? But Mao knew early enough that his policies were resulting in famine. He could have changed course, but he stubbornly stuck to his guns in order to retain power. In addition, his purging of senior leaders set the tone at the grass-roots level; if he had pursued a less radical policy and listened to advice, and encouraged his underlings to do so as well, their actions would surely have been different. But Mao’s policies were responsible for other deaths on top of those caused by the famine. The Cultural Revolution—the 10-year period (1966-1976) of government-instigated chaos and violence against imagined enemies—resulted in probably 2 to 3 million deaths, according to historians such as Song Yongyi of California State University Los Angeles, who has compiled extensive databases on these sensitive periods of history. I called to ask for his estimates, and he said he would add another 1 to 2 million for other campaigns, such as land-reform and “anti-rightist” movements in the 1950s. The University of Freiburg’s Daniel Leese gave me similar figures. He estimates 32 million in the Great Leap Forward, 1.1 to 1.6 million for the Cultural Revolution, and another million for the other campaigns. It is probably fair to say, then, that Mao was responsible for about 1.5 million deaths during the Cultural Revolution, another million for the other campaigns, and between 35 million and 45 million for the Great Leap Famine. Taking a middle number for the famine, 40 million, that’s about 42.5 million deaths. At this point, I must digress briefly to deal with two specters that diligent researchers will find on the Internet and even on the shelves of otherwise reputable bookstores. One is the political scientist Rudolph Rummel (1932-2014), a non-China specialist who made wildly higher estimates than any other historian—that Mao was responsible for 77 million deaths. His work is disregarded as polemical, but has a strange life online, where it is cited regularly by anyone who wants to score a quick victory for Mao. Equally scorned but extremely influential is the British-based author Jung Chang. After writing a bestselling memoir about her family (the most popular in what now seems like an endless succession of imitators), she moved on to write, along with her husband, Jon Halliday, popular history, including a biography of Mao as monster. The “peacetime” adjective is significant because it gets Hitler out of the picture. But is starting a war of aggression less of a crime than launching economic policies that cause a famine? How, finally, does Mao’s record compare to those of Hitler or Stalin? Snyder estimates that Hitler was responsible for between 11 million and 12 million noncombatant deaths, while Stalin was responsible for at least 6 million, and as many as 9 million if “foreseeable” deaths caused by deportation, starvation, and incarceration in concentration camps are included. But the Hitler and Stalin numbers invite questions that Mao’s higher ones do not. Should we let Hitler, especially, off the hook for combatant deaths in World War II? It’s probably fair to say that without Hitler, there wouldn’t have been a European war. Then again, wasn’t Stalin partly responsible for those deaths, because he purged his best generals and adopted reckless military policies? As for Hitler, should his deaths include the hundreds of thousands who died in the aerial bombardments of Germans cities? After all, it was his decision to strip German cities of anti-aircraft batteries to replace lost artillery following the debacle at Stalingrad. And what of the millions of Germans in the East who died after being ethnically cleansed and driven by the Red Army from their homes? On whose ledger do they belong? These considerations add to Stalin’s totals, but they still more increase Hitler’s. Slowly, Hitler’s numbers approach Mao’s. And there is the sensitive matter of percentages. Mao’s numbers are high because of the famine, without which he wouldn’t be in the running for butcher of the century. But if Mao had been the leader of Thailand, he wouldn’t be in the running: it was because his policies played out in China, with the world’s largest population, that they resulted in such high absolute numbers of deaths. So is Mao simply a reflection of the fact that anything that happens in China becomes a superlative? And that, by definition, the world’s Pol Pots can never compete? Relativizing can be perilous. As Snyder writes, “the difference between zero and one is an infinity” (thinking, perhaps, of the dictum often attributed to Stalin that “a single death is a tragedy; a million deaths is a statistic”). It is true that we can grasp when a loved one dies but have a harder time accepting when the difference is between a million and a million and one deaths. But the correct answer, of course, is that even one extra death tilts the scales. Death is an absolute. Xi Jinping has held fast to this view of Mao in recent years. In Xi’s way of looking at China, the country had roughly 30 years of Maoism and 30 years of Deng Xiaoping’s economic liberalization and rapid growth. Xi has warned that neither era can negate the other; they are inseparable. How to deal with Mao? Many Chinese, especially those who lived through his rule, do so by publishing underground journals or documentary films. Perhaps typically for a modern consumer society, though, Mao and his memory have also been turned into kitschy products. The first commune—the “Sputnik” commune that launched the Great Leap Forward—is now a retreat for city folk who want to experience the joys of rural life. One in 10 villagers there died of famine, and people were dragged off and flayed for trying to hide grain from government officials. Today, urbanites go there to decompress from the stresses of modern life.